Download our music free until April 30! For the next two weeks, from now until April 30, we’re offering free downloads of our 3-song EP Three Stories to anyone who follows us on Twitter or becomes a fan on Facebook. How does it work? Well, as soon as you click the requisite “follow” or “like” buttons on said social networking sites, just shoot us a quick message and we’ll reply with a code for you to enter on www.digstation.com. Enter this code in the section marked “Redeem Download Cards” and the download should start automatically. Included are the three songs from the EP, and all the album art you would get if you bought a CD (which, of course, you can also do here). What happens if you already follow us? Then you’re totally rad, and definitely entitled to a free download. Maybe two! So tell your friends!! And don’t forget — this is only until the end of April, so email us soon!!! Download our 3-song EP Three Stories - Free until April 30, 2012! We hereby announce the launch of our record label’s new website, www.lokashaktirecords.org. Through various channels Lokashakti Records is committed to promoting innovative and incisive protest music from around the world. The creation of this website marks the label’s biggest promotional landmark since its founding in 2010. The website also contains a brand new Online Record Store, where you can purchase our music on CD. This is where we’ll eventually be making available t-shirts, stickers… probably pens, underwear, collectible lunchboxes… and then more than likely digital downloads, too. Pick up a CD — only $5 — and check back soon for other additions to the Loka product line. In addition, Lokashakti Records is on Facebook and YouTube, and of course, part of the Lokashakti Network. Make sure to stay on top things by signing up for the mailing list! Welcome to Lokashakti Music online! Today marks the launch of the first of four brand new websites we’ll be rolling out in the next month, all geared towards promoting some of the various initiatives of our nonprofit organization, Lokashakti Inc. As these initiatives begin to build up steam – first with the band Lokashakti, then following closely on its heels our record label, Lokashakti Records, a new blog called Protest Music, and finally our brand new social media / activism resource, the Lokashakti Network – we hope for these sites to provide a simple way to assimilate the different ideas we’re putting together. While it’s still a bit under construction, this particular website is for the band Lokashakti. Feel free to have a look around, read about how we got started, and check out some of the songs we’ve written. Then by all means let us know what you think, and connect with us in whatever way you can – by signing up for our mailing list, following us on Facebook, Twitter, or elsewhere online, buying our music and supporting the work of our nonprofit organization, or eventually taking advantage of the Lokashakti Network’s unique blend of online resources for activists. Shukriya! 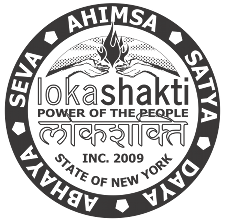 The band Lokashakti provides a unique means of promotion and funding for Lokashakti Inc., a New York City-based nonprofit organization. Since 2009 our nonprofit organization has been working to create networking, organizing, and educational resources for activists and activist groups. Our efforts include the brand new Lokashakti Peace & Social Justice Network - a collection of people, organizations, and events geared toward promoting peace and social justice through collective nonviolent action. Get involved today by browsing the Network, creating an account, volunteering, or donating online.